Make sure the Ride Right vest or protection device you have selected has been designed for your size. Severe body injuries, including paralysis or death may occur despite the use of a vest or any other device. No Body Protector can prevent against spinal injuries, Commotio Cordis (sudden disturbance of heart rhythm) or crushing injuries that may occur in motocross activities. No Body Protector can prevent against injuries that result from severe torsion, flexion or extension of the body that may occur while participating in motocross / dirt bike activities. For maximum performance, the vest must be sized and fitted to match the person for which it is to be worn. The vest or protection device must be adjusted so as to remain securely in position when adjusted for the proper fit. The vest or device must be inspected regularly before and after each ride and it must be free from breaks, rips , tears and all closures must function properly. If the product shows signs of damage, or if the condition is in doubt, it should be replaced or refurbished. We here at MotoXvest strongly believe our vest is the best motocross vest you can buy. 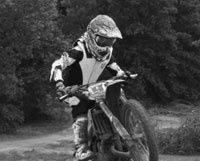 It was engineered and manufactured specifically for motocross riders and racers. Our vest is the only vest that features 4th-generation ballistic shock-spreader material inside the vest. This is same material and technology used in bulletproof vests and bull riding. The MotoXvest weighs roughly 2 pounds, features air channels to keep riders cool, flexes with your body, and fits with most neck braces (specifically, the Leatt). 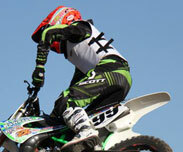 The nation’s leading bull riding vest company, Ride Right, manufactures the MotoXvest. Ride Right has 80% of the Professional Bull Riding (PBR) bull riders on TV using their vest. I wanted the best for my son, so I went to the best: Ride Right. 1. Helps protect the collarbone from the neck brace with the ballistic shock-spreader material. 2. Fits the Leatt, Omega, Atlas and Alpinestar. 3. Never ending improvments for motocross. 4. Cooling channels to direct the air around the rider. 5. Pressure washer friendly just wet and add some simple green and wash like your boots. 6. Velcro extensions for more full size riders. 7. Updated styling for moto. customer service is key in doing do that. phone all the time, even at night. I’ve always believed you can't put a price on safety. "I built this vest for my son, I spared no expense making it the best I could." "MotoXvest !! Money well spent and once you get it you will understand why!! Best vest out there right now!! We won't ride without it!! "